Because there are so many different forms and means of social networking now a days, we made it a point to highlight the top 5 social media platforms that you, as a networker, should be using. Do you remember what the top 5 platforms are? They’re Facebook, Twitter, LinkedIn, Google+ and Blogs! So why these 5? Well for starters you can reach a variety of different people across each platform. LinkedIn allows you to reach out and stay connected with a professional audience, Facebook (FB) lets you to share with your friends and family, Twitter helps you reach out to a more global audience, Google+ lets you control who you share your information with and get better search engine rankings, and Blogs help you grow a following and build credibility. And that’s big, especially if you are looking to build your personal brand via your online profile. We can’t stress enough that who you are online represents who you are offline. So make it a habit to stay consistently active on all 5 of these platforms. Because the more you share with your online network before, during and after an event, and the more you update your profile, the more they will get to know who you are. And more importantly, the more you will start to build visibility and credibility. At first it might take some time getting used to, especially if you’re new to social media. But with practice and constant updating, you’ll soon get the gist of it. And you’ll become addicted! Which isn’t a bad thing. As long as you’re properly utilizing these platforms in the right ways. Share content and information that is relevant to you and that best represents you using the event hashtag (don’t just go off on rants and share things that are irrelevant or things that might put people off ). Review the online profiles of the people that have signed up for the event before an event so that you can become better acquainted. It will give you an advantage when you get to meet them in person, because you’ll already know a little bit about them from their profile. Draft some tweets with the event hashtag, organizers, venue, speaker(s), etc [we have identified 7 event stakeholders] twitter handles so you can easily tweet them at the event. It’s important that other networkers can easily find you and get to know you online before they meet you offline, and vise versa. Connecting before an event just makes it easier, because you’ll already know who and what to expect at the event. So make sure you make an online appearance and make it clear that you’re the attending the event. Look for the people that you have already connected with online before the event. We recommend starting with the event organizer(s) as they will introduce you to other people. It’s important to stay active and use the event hashtag during the event when ever possible. This will keep you connected and will give you a chance to bond with other event guests via social media platforms that are used. Posting things like pictures and check-ins quickly spark conversation and start new connections. For more tips on how to better network during an event read: Top 5 Things to do on Social Media During an Event. 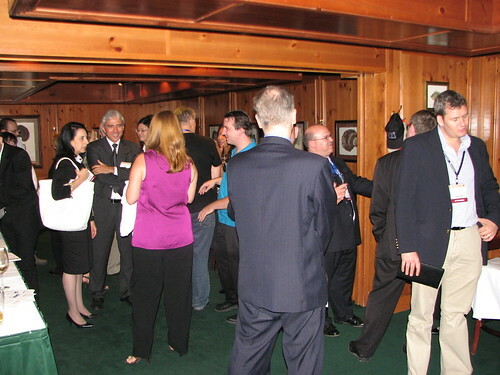 Follow-up with event guests after an event. The first 24-48 hours of meeting someone is best the time for you to followup. It’s the time needed for you to become more memorable. It’s okay if you need a reminder on how to properly utilize these platforms. And if you do, don’t hesitate to (re)read how to better network before, during, and after via the top 5 social media platforms. Or if you really interested in learning more tips and resources to help you become a better networker, make sure to signup for the upcoming Networking 2.0 Book and subscribe to this blog. We hope these tips help you become the networker we know you can be!